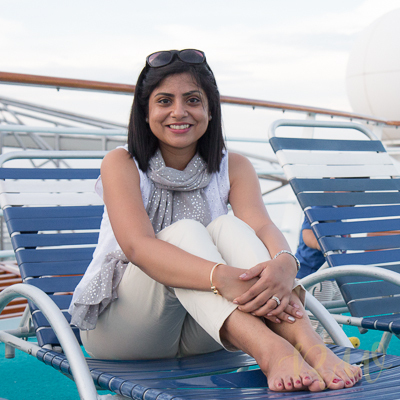 Summer calls for parties, holidays and lots of socialising….. Recently at our friend’s place I had the yummiest fruit salsa I’d ever tasted. 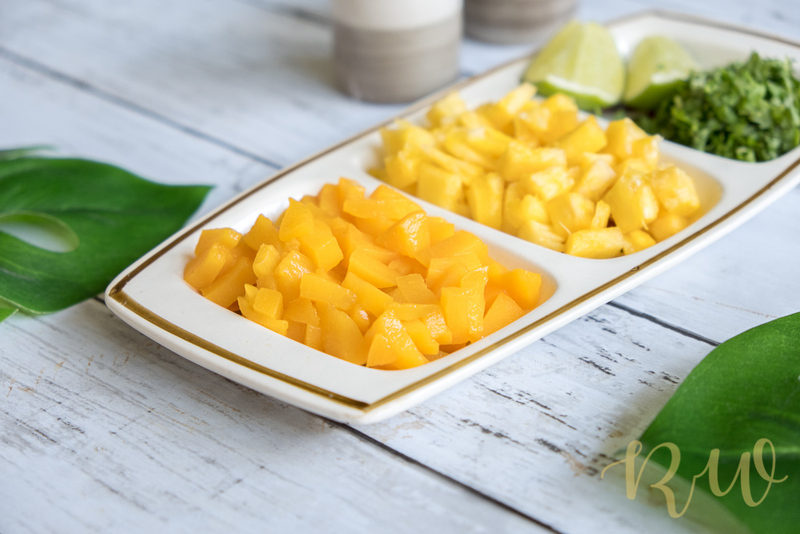 It was with the creamiest and the sweetest mangoes, with zing from bell peppers and lots of mint leaves! The flavours exploded in my mouth and surprisingly until then I had no idea about ‘fruit salsas’ at all! I had to get the recipe from her and to start experimenting with other fruits and flavours. I am a super big fan of pineapples, in any form! 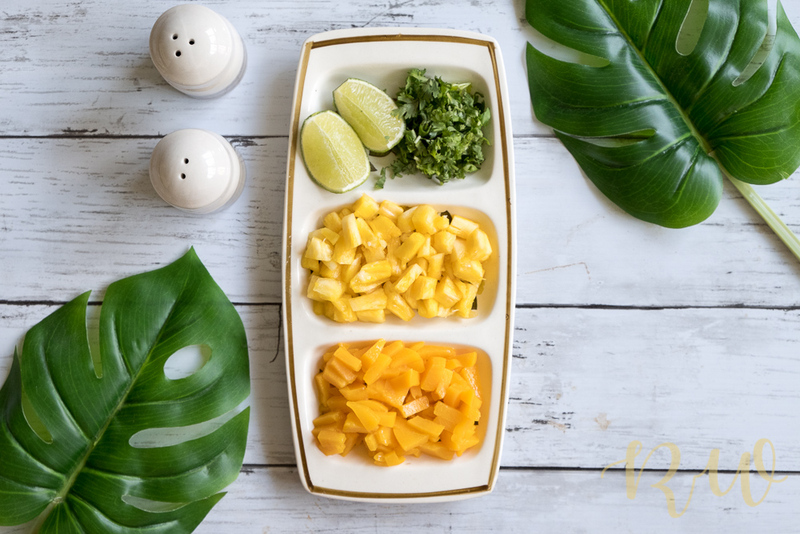 Adding pineapples to salsa just made so much sense because of the tangy and sweet taste of this summer fruit. To it I added some canned peaches that were lying around, and the combination was a winner. 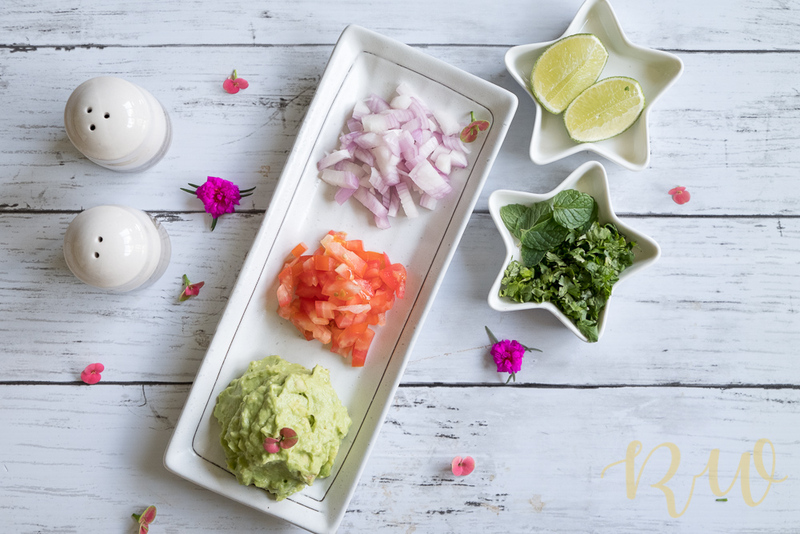 Mix everything in a small bowl and you have yourself the easiest (not to mention, one of the tastiest) salsas which will taste heavenly with grilled chicken, fish, et al. Or if you are like me, you will just finish it off the bowl on its own, while reading a book. Fruits like, strawberries, mangoes can also be added or substituted for the same. 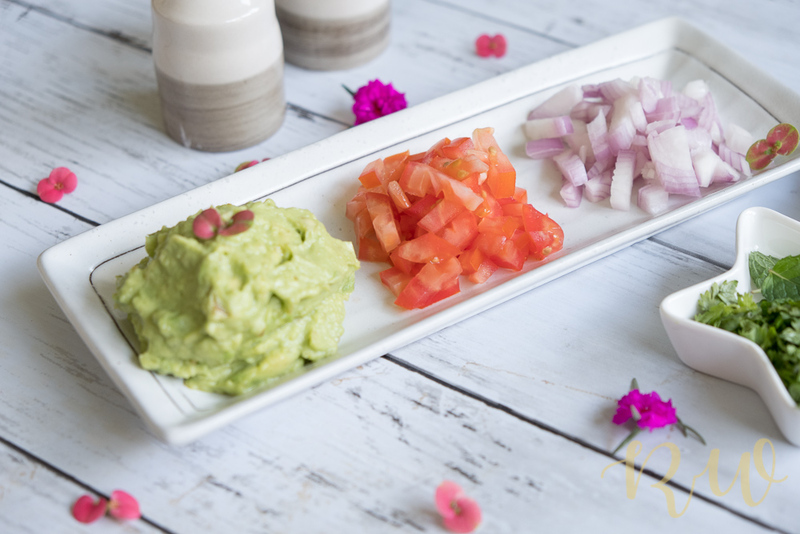 So simple to make yet so fancy, just enough to impress your guests with some home-made finger-licking guac. The trickiest part – check for ripeness by gently pressing the brown outside of the avocado. If there is no give, the avocado is not ripe yet and will not taste good. If there is a little give, the avocado is ripe and just right to be eaten. If there is a lot of give, the avocado may be past ripe and not good. 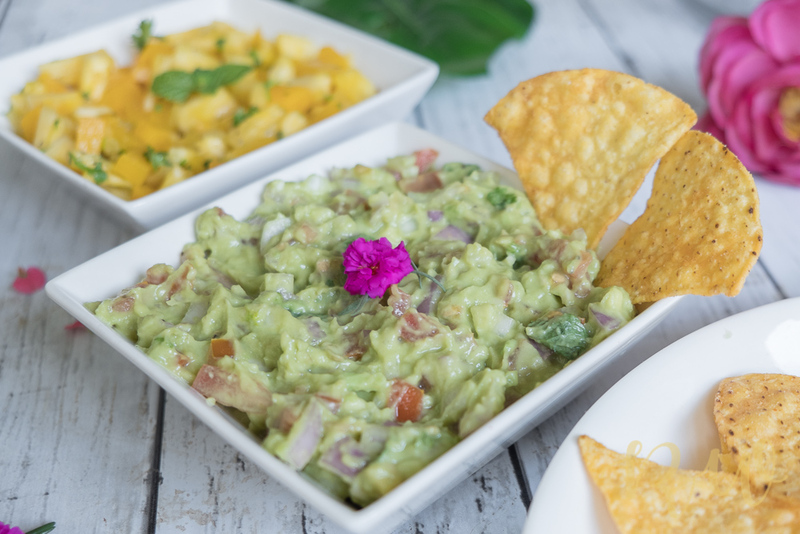 In this case, taste first before making guacamole. Hand full of chopped coriander and mint. If your avocado is slightly un-ripe, you can use a mixer to make it into a chunky paste, add few tablespoons of extra virgin olive oil to make it smooth. Mix everything together in a bowl. This dip is not only tasty but it is also great for health. 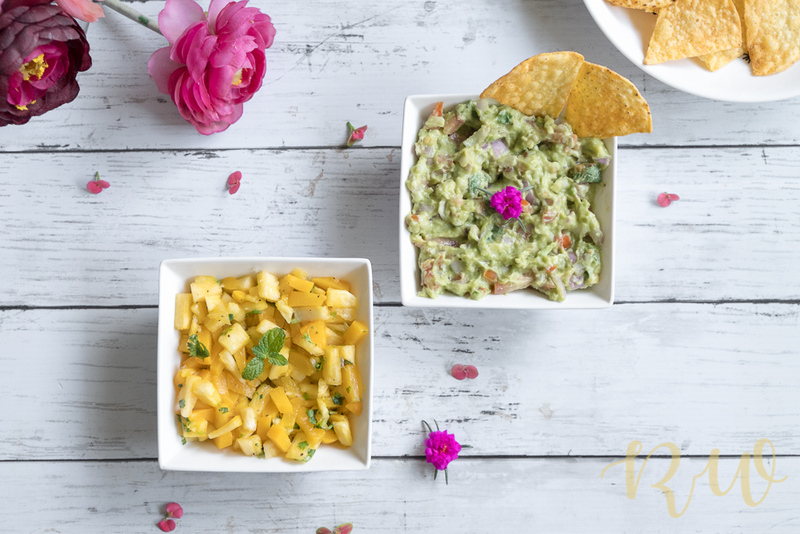 Summer parties are great fun with some dips and chips, so do let me know if you make these yummy super easy dips for for your fiestas! I love making dips. Will try yours soon. Thanks. These are some really nice and quick recipes! With summers here, I have to think of interesting snacks everyday. The salsa sounds cool. I have tried pineapple salsa but peach looks interesting. Have to try the guacamole recipe too. Both look yummy. Yum! I pinned this to my food board! I love pineapples myself. Am definitely going to bookmark this recipe.